Vishwakarma, the Architect of the Gods, is the presiding deity of craftsman, artisans and builders in the Hindu cosmology. He is the manifestation of the creative power of the Supreme Being and designed the tripartite universe consisting of the mortal world, the heavens and the netherworld at the behest of Brahma, the Creator. Vishwakarma also built the palaces of the Gods as well as their many weapons and chariots. Although a minor divinity within the Hindu pantheon, Vishwakarma is frequently mentioned in the Vedas and other scriptures in his capacity as the Celestial Architect. The literal meaning of the title Vishwakarma is “all-maker” (vishwa means ‘all’ and karman means ‘maker’ or ‘doer’). The Rig Veda refers to Vishwakarma as the divine architect of the universe, a personification of the creative power of the Supreme Being. The great Hindu epic Mahabharata describes him as “the Lord of the arts, executor of a thousand handicrafts, the carpenter of the gods, the fashioner of all ornaments, the most eminent of artisans on whose craft men subsist, and as a great and immortal god.” In the Brahmanas, Vishwakarma is identified with Prajapati himself as the creator of all things. Vishwakarma is a symbol of the beauty, aesthetic and philosophical perfection, as well as utility of any material construction, be it architecture, art or craft. Pancha Mukha Virt VishwakarmaVishwakarma is visualized as the Ultimate reality in Rig veda, from whose navel all visible things emanate. The same imagery is seen in Yajurveda purusha sukta, where the divine smith Tvastar originates from Vishwakarma. This concept developed later in the puranic period as Padmanabha. As he is invoked as AJA the unborn, he is the primordial personification of the upanishadic abstract concept Parabrahman. In Vedic period the term first appeared as an epithet of Indra, Surya, and Agni. In that time Brahma might have been hidden in the concept of Vasthospathy or Brahmanaspathi. In the last phase of vedic period and during the growth of monotheism, the top position of God was gradually assigned to Vishwakarma who was perceived as a hotar, a universal father, the creator and an all seeing god who has faces, eyes and feet on every side; and who produced all the Heavenly, Earthly and other Celestial realms and preserves them through the exercise of his arms and wings. He is the name giver of all later gods. He sacrificed himself to himself for the evolution of this visible world, thus he is Purusha. His attributes like Vachaspathy connect him with Brahaspati (the Guru of Gods). Again, Yajurveda pictured him as Prajapati (the Lord of Creation), and in the Atharva veda he is Pasupathy. Shwethashwatharopanishad described him as the one who is dwelling in all living forms. Later in the post vedic period, the term appeared as a Rsi as well as a Silpi. The Rsi Bhuvana Vishwakarma (Atharva/Angirasa Gothra) was the author of Rg 10-81,82 suktha, whereas Silpi Vishwakarma (Prabasa Vishwakarma) was probably the son of Prabhas, the eighth hermit of the legendary Astam vasu and Yogasiddha, sister of Brihaspati. He is said to have revealed the Sthapatyaveda or fourth Upa-veda, and presides over the sixty-four mechanical arts. In later puranas he is sometimes identified with vedic Tvastr. Silpy Vishwakarma is the designer of all the flying chariots of the gods, and all their weapons and divine attributes. Vishwakarma is also credited with creating the missiles used in the mythological era, including the Vajra, the sacred weapon of Lord Indra, from the bones of sage Dadhichi. He is regarded as the supreme worker, the very essence of excellence and quality in craftsmanship. Wise and mighty, Vishwakarma is usually portrayed as a powerfully built and aged deity. Although the Rig Veda describes him as having “eyes, mouth, arms and feet on all sides”, most popular representations show Vishwakarma with one face and four arms. He is usually depicted covered in gold jewelry, holding a water pot, a book, a noose and craftsman’s tools in his four hands. Because he represents an active creative power, Vishwakarma is portrayed with a reddish hue, with red being the color of passion and activity in Hindu philosophy. His mount, like Brahma, is a white swan. Vishwakarma is attributed with the construction of the legendary cities in Hindu mythology as well as the divine weapons and chariots of the Gods. The jewelry worn by the gods were also fashioned by Vishwakarma. His creations include the palaces of Yama and Indra, as well as the underwater dwelling of Varuna, the Hindu god of the oceans. Vishwakarma also built the mythical city of Dwaraka, which was home to Lord Krishna and was submerged by the ocean after he departed the mortal world following the end of the Mahabharata war. Vishwakarma also built the cities of Hastinapur and Indraprashta, capital of the Kauravas and Pandavas respectively, the two warring parties in the Mahabharata. 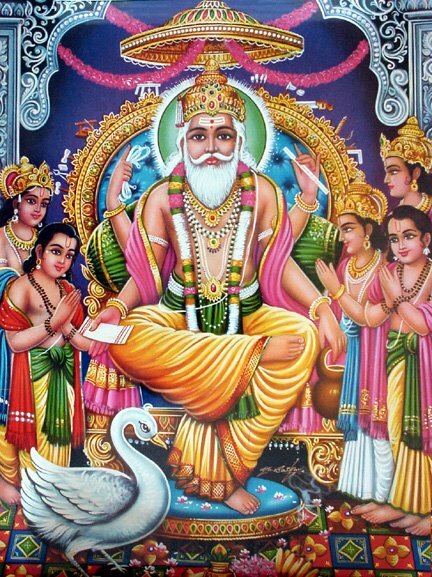 Another legend relates Vishwakarma to the other great Hindu epic, the Ramayana. When Shiva wed Parvati, he bade Vishwakarma to build a palace worthy for them to reside. He built a magnificent golden palace on the island of Lanka, and to perform the grihapravesha, or house-warming ceremony, Shiva invited Ravana who was then a wise devotee of Lord Shiva. As recompense, Shiva offered anything that Ravana desired, and overwhelmed by the beauty of Vishwakarma’s architecture, he requested the palace itself. Obliged by the request, Shiva acceded and the golden palace became Ravana’s capital, setting the scene for the events of the Ramayana which was to unfold ages later. The Markandeya Purana contains the story of Vishwakarma’s daughter Saranya who was married to Surya, the sun god, but unable to endure the heat and brilliance of the sun’s rays, requested her father to reduce their intensity. Vishwakarma then cut away an eighth part of the sun’s brilliance, and used fragments of the rays that fell to earth to build the discus of Vishnu, the trident of Shiva, the Vel of Muruga and other divine weapons for the devas. He also appears frequently in other Hindu scriptures and legends, where he is called upon to build palaces or weapons at the behest of the Gods. Vishwakarma is said to have revealed the Sthapatya Veda, an upaveda (class of writings subordinate to the four main Vedas), which contains the science of mechanics and architecture. The work includes various treatises on the sixty-four traditionally recognized mechanical arts. Other Hindu manuals on architecture and sculpture are also attributed to Vishwakarma. There is also a story behind the construction of Golden Lanka. When Lord Shiva married Parvati, he asked Vishwakarma to build a beautiful palace for them to reside. Vishwakarma put up a palace made of gold! For the housewarming ceremony, Shiva invited the wise Ravana to perform the "Grihapravesh" ritual. After the sacred ceremony when Shiva asked Ravana to ask anything in return as "Dakshina", Ravana, overwhelmed with the beauty and grandeur of the palace, asked Shiva for the golden palace itself! Shiva was obliged to accede to Ravana's wish, and the Golden Lanka became Ravana's palace. Among the many mythical towns Viswakarma built is Dwarka, the capital of Lord Krishna. During the time of the Mahabharata, Lord Krishna is said to have lived in Dwarka, and made it his "Karma Bhoomi" or center of operation. That is why this place in nothern India has become a well known pilgrimage for the Hindus. After the palace was built, the Pandavas invited the Kauravas, and Duryodhan and his brothers went to visit Indraprastha. Not knowing the wonders of the palace, Duryodhan was flummoxed by the floors and the pools, and fell into one of the ponds. The Pandava wife Draupadi, who witnessed this scene, had a good laugh! She retorted, hinting at Duryodhan's father (the blind king Dhritrashtra) "the son of a blind man is bound to be blind." This remark of Draupadi annoyed Duryodhan so much that later on it became a major cause for the great war of Kurukshetra described in the Mahabharata and the Bhagavad Gita. Hindus widely regard Vishwakarma as the god of architecture and engineering, and September 16 or 17 every year is celebrated as Vishwakarma Puja — a resolution time for workers and craftsmen to increase productivity and gain divine inspiration for creating novel products. This ritual usually takes place within the factory premises or shop floor, and the otherwise mundane workshops come alive with fiesta. Vishwakarma Puja is also associated with the buoyant custom of flying kites. This occasion in a way also marks the start of the festive season that culminates in Diwali. The OM is generated from Virad Viswabrahmadeva | So he is not only the source of all knowledge,Language, Word, Silpa,Art But also Source of entire universe.